WASHINGTON — The once-proud and powerful unions that ran the city of Detroit have begged but now threatened the city’s emergency manager to scale back pension cuts. 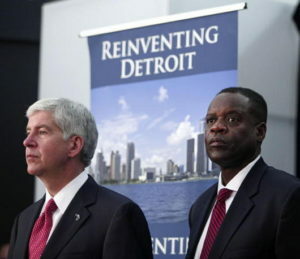 Reuters reported  that Kevyn Orr, the appointed emergency manager by Republican Michigan Governor Rick Snyder, made pensions cuts a necessary action to pull Detroit out of bankruptcy. The unions refused to recognize  that the city of Detroit, the once-powerful Motor City, has $18 billion in debt. Most of that was due to the heavy and burdensome public employee pension costs , which have driven other American cities to bankruptcy. Union leaders testified in court that they were not authorized to cut pension costs, but claimed that pensions were protected in the state’s constitution. One example of the dangers of public employee pension debt was Stockton, California. Detroit officially filed for municipal bankruptcy  this past July and made national headlines. Orr is in charge of filing financial restructuring plans to help bring the city back from bankruptcy.